You’ve met this great guy online and feel like it’s time to meet. It’s exciting and exhilarating but slow down! It’s time to proceed with caution. Meeting someone overseas is a big step. Online dating is one of the most popular ways to meet a partner and it’s opened up the world in a way that nothing else ever has. This also means being exposed to a lot more danger than ever before. Bad things can happen anywhere but it’s important to take steps to protect yourself physically and financially. I get countless emails from women who have met Moroccan (and sometimes from other Arab countries) men and want me to weigh in on the validity of their relationships. I refuse to do this because I don’t personally know either of them. But, 99% of the time my brain is screaming RUN! There are so many bad scenarios and situations that people find themselves in, hoping that it’s simply cultural differences that will later be resolved. This is most often not the case and both people are left having had a bad experience and judging all men by the same yardstick. The reality is THERE ARE men who simply want to scam women for money, residency, or a way out of the country. There are also men who are insanely genuine; unfortunately the bad often outweigh the good. 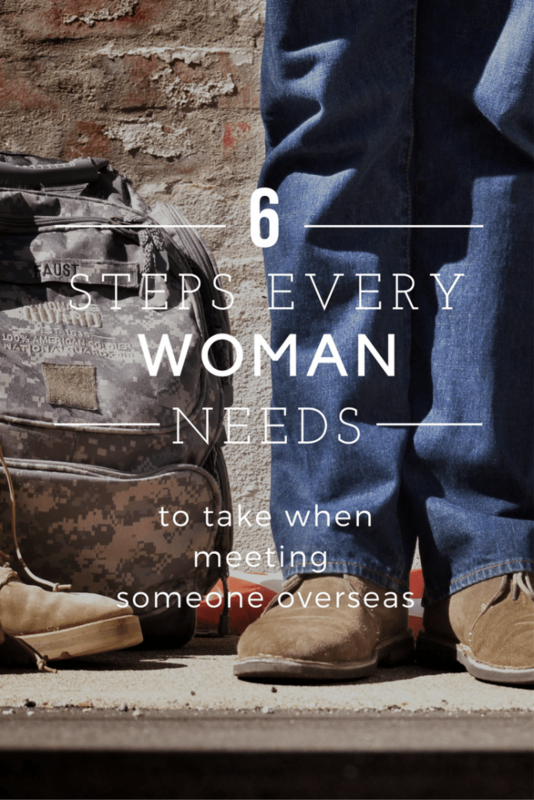 So, if you find yourself in a situation where you’ve met someone overseas, what should you do? Consider these six things. I did my share of crazy. Many people would say that what I did after I met MarocBaba was insane, and maybe it was. I know personally of a lot of women meeting men online in other countries and then uprooting their entire lives to move to said country and start a life together. Sometimes it works, but a lot of times it ends up leading to big problems. Things aren’t always what they seem. When considering a relationship it’s fine to let your heart lead you but use your head too. If something seems off, trust your instinct. Listen to your gut. Do not allow yourself to get so wrapped up in romance or the idea of something that you ignore everything else. Use the same yardstick you would with a man from your own culture, don’t play off things simply because “he’s from a different culture.” If you really can’t stand a certain trait don’t assume it will ever change. Like, a really clear record – this is not the time to evasive or elusive. This should include copies of your passport, travel documents, addresses where you will be staying and who you will be with. If this changes while you are traveling, update someone at home with the information. If you will be meeting someone new, get as much of their information as possible. Where they live (address), their full name, birthday, parents names, as much information as you can. Ask them for a copy of their national ID card. If they don’t want to share this information it should be considered a big red flag. Protect yourself first and foremost. Talk with your friends and family before you travel to give them a rough timeline of your plans. Let them know how often you will try to check in. Create a plan with them on what they should do if they don’t hear from you within a determined time period. Do NOT trust someone at face value. You should do some research to know not only who the person you are meeting us but learn about the place you are going. Make sure you have the numbers for your embassy or foreign mission. You also should research ahead of time so that you know how to reach them, not only by phone but physically. Is there a bus route? Do you need a taxi? Make sure that you have money available to do this. Likewise, if you are meeting someone new it is advisable that you book a hotel room or private accommodation. If you do decide to stay with the person you are meeting have enough money and resources available to leave if you need to. Most all countries have a program in place for their citizens to register when they are traveling abroad. Do it and keep the information updated. If your family is unsure where you are or if you are in need of assistance, your government needs to have as much information about you as possible to help find you. This is also important if there is a natural disaster or other emergency in the country you are visiting. Embassies work to identify where there citizens are and if they have been affected. If you don’t let them know where you are, they won’t know where to look for you. If you’re a US Citizen this is where you would register – STEP Enrollment. If I had a penny for all of the stories I have heard men tell women about how they’re going to wine and dine and sweep them off their feet I could own an island by now. The bottom line is, if something sounds too good to be true, it probably is. Don’t let your emotions or your desire for it to be true, overcome the reality of what it is. I truly believe that most people in the world are good but I also know that they are not. 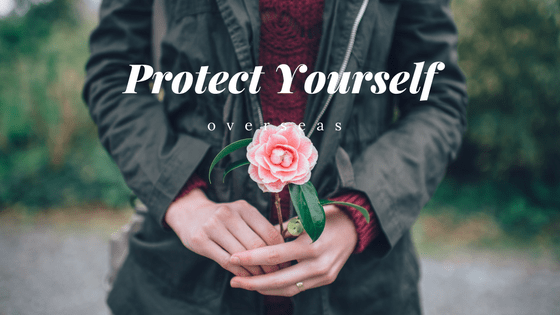 This post isn’t meant to scare people out of visiting other countries (because bad things happen everywhere) but are some practical tips that should be kept in mind to stay safe when traveling. Salaam Amanda! Thank you for this and all of your other wonderful posts. I am considering a trip to Casablanca soon to meet my boyfriend of almost 2 years for the first time. We have taken things very slowly, as I met him online shortly after separating from my ex-husband and needed time, but we are now seriously considering marriage. 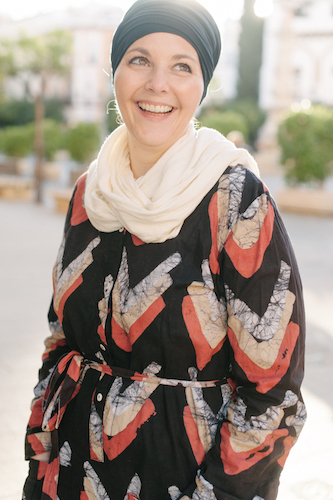 I know it is illegal to stay in the same hotel room with a Moroccan, and we have no plans to break this rule, but I’ve also heard that Moroccans can face a lot of trouble just walking down the street with a foreigner. Is it true that Moroccans need some sort of paper from the local police in order to be seen with a foreigner? (I’m American, white, and a bit older than him.) Also, would he or his family be able to visit me in my hotel room there? I would be staying in a decent (mid-range?) hotel in Casablanca. There is a paper that they can get from the local police just in case you were to run into problems. Him going to your room alone might cause issues, his family maybe not. I’d consider maybe a meeting spot that isn’t the hotel room if you want to be on the safe side. I think that anyone traveling overseas should tell at least one trusted person where they are going and who they will be with. It doesn’t have to be a parent but it should be someone that knows and there’s a plan if contact isn’t made. Way too many bad things happen to especially women in situations where no one knows where they are or who they are with. 1) Honesty – Insist on it! if you have to lie to, about or for your love interest – ? 2) Money – Protect it! If you’re giving, hiding or the only one spending – ? 3) Standards – Don’t lower them or accept less than you would at home – ? I know any relationship has the potential for deceit, but adding the foreign component means taking care of #1 (Ex: Interpol check, pre-nup! ).